Having modern day machines has had immeasurable impacts on the way we do	business, but ensuring those machines are functioning properly is tremendously	important, especially when things go wrong. Fortunately, the experts here at	Millican Crane have the experience and equipment to handle any type of service or repair	to big rig engines, semi trucks, diesel engines and more. We are not just	a crane shop and our service center is well equipped with the latest technology	to adequately serve our customers. For more information on all of our	services, call us at 360-930-6685 and remember here at Millican Crane,	our loyal customers come first. We look forward to serving you! Here at Millican Crane, we’ve been in the business long enough to	have seen all types of repairs and services needed, and we know that these	types of engines take specialized, expert level care. Our technicians	are well trained and finely tuned to all of the regular maintenance, installation	services, repairs, conversions, and more that are needed. We know that	each job is different and want to give the most personalized, custom service	possible because we know that time is money, but that quality service	takes time. We want you back on the road in no time. Your specific needs	will always be #1 when we are completing your job, and our fully certified	mechanics are second to none in the area. In addition to this above mentioned services, we are proud to offer Federal	Department of Transportation (DOT) Annual Inspections to our customers,	a must for any trucker. Handle the mechanical AND logistical aspects under	one roof at Millican Crane! For the Olympic Peninsula, Tacoma, and Seattle areas, Millican Crane is	proud to offer 24 Emergency Service. Our technicians are on call at all	hours of the day and night in case an issue arises. Remember, small issues	that seem minor can easily turn into a major situation that can be costly	and potentially dangerous for you and those around you on the road. 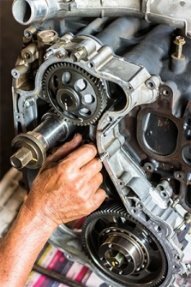 Trust	the experts at Millican Crane to diagnose and fix whatever engine troubles	come upon you. We look forward to serving you and getting you back on	the road as fast and safely as possible. With competitive rates and expert	care, Millican Crane is your engine expert. Call us today at 360-930-6685	to hear more about all of our services. Don’t let your engine troubles cause you any more headaches. Trust	the experts at Millican Crane to get you truckin’ ASAP! Call 360-930-6685	today for more information!